University Of North Carolina Charged With 5 'Level 1' Violations By NCAA : The Two-Way The NCAA has been looking into the case for several years, after allegations of widespread grade inflation for student athletes at the school. 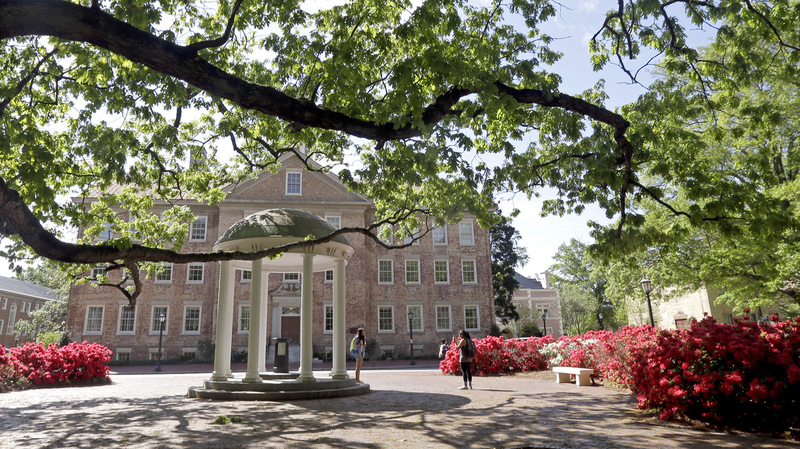 The Old Well on campus at The University of North Carolina in Chapel Hill, N.C. Reports from the school and the NCAA say UNC-Chapel Hill faculty and staff oversaw a student-athlete grade-inflation scheme that lasted almost twenty years. Last October, the University of North Carolina at Chapel Hill released findings from an internal investigation that revealed approximately 3,000 students — mostly student athletes — had their grades inflated through sham courses in the school's African and Afro-American studies department over a span of almost 20 years. -University faculty and staff provided "special arrangements to student athletes that were not generally available to the student body," including offering classes as independent study courses with little if any attendance requirements and "artificially high final grades." -A philosophy instructor who also served as an athletic academic counselor "knowingly provided extra benefits in the form of impermissible academic assistance and special arrangements." -The head of the school's African and Afro-American studies department and a student services manager in that department withheld information from the NCAA during their investigation and refused to participate in interviews with UNC officials and NCAA enforcement staff. -The university failed to monitor the behavior of faculty and staff involved in the grade inflation scheme. The school also failed to monitor the academic departments involved. The NCAA says the sham courses existed for 18 years and went mostly unchecked by the school. "We believe the University has done everything possible to address the academic irregularities that ended in 2011 and prevent them from recurring. We have implemented more than 70 reforms and initiatives to ensure and enhance academic integrity. We will continue to monitor the effectiveness of those measures and, wherever needed, put additional safeguards in place." The statement also says, "Although we may identify some instances in the NCAA's notice where we agree and others where we do not, we are committed to continue pursuing a fair and just outcome for Carolina." UNC-Chapel Hill says once it responds to the NCAA's notice of allegations, the NCAA has 60 days to send its own response. A hearing will then take place "later this fall," with final infractions expected six to eight weeks later. NPR previously reported on UNC-Chapel Hill's grade inflation scandal, which first came to light in 2011. Last October, the school said it would launch a new public records website to "enhance accountability," add faculty to a group that reviews student athlete eligibility, establish a working group to help people share concerns about academics, and implement a plan to "stabilize" the school's Department of African, African American and Diaspora Studies, the department where most of the grade-fixing took place.